If you live in Los Angeles and you’re looking to save space in your child’s bedroom, a high-quality youth loft bed is a great way to maximize floor space while ensuring a good night’s sleep. At Kids Only Furniture, we offer both twin and full loft beds, so you can provide your kid a comfortable place to sleep while offering ample space for everyday activities. Whether you still have young children or your little ones are growing up too fast, our kid’s loft beds are designed with children of all ages. With functionality and style in mind, we’re confident that you’ll find that we have the most premium selection of kid’s loft beds in the Los Angeles area. At Kids Only Furniture, we believe that a healthy room makes a healthy child, which is why we provide youth loft beds that accommodate all tastes and budgets. So, when you invest in one of our designs, you’re giving your children the space they need to work and play without sacrificing their quality of life. We can even help you customize the finishing the touches that can make a loft bed perfect for your child’s room from unique storage options to custom finishes. 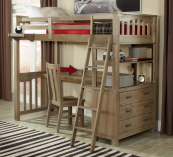 A loft bed is a great way to give your kids a cool place to sleep while maximizing storage space. Once you decide the type of youth loft bed you want and choose custom wood and finish options, you can match pieces like chests, desks, and shelves to make the most of your child’s room. We encourage you to pay a visit to one our three stores or give us a call if you have any questions about our products and services. So, if you have any questions about our loft beds, any of our products, or for more information about our three stores in the Los Angeles area, get in touch with us today.